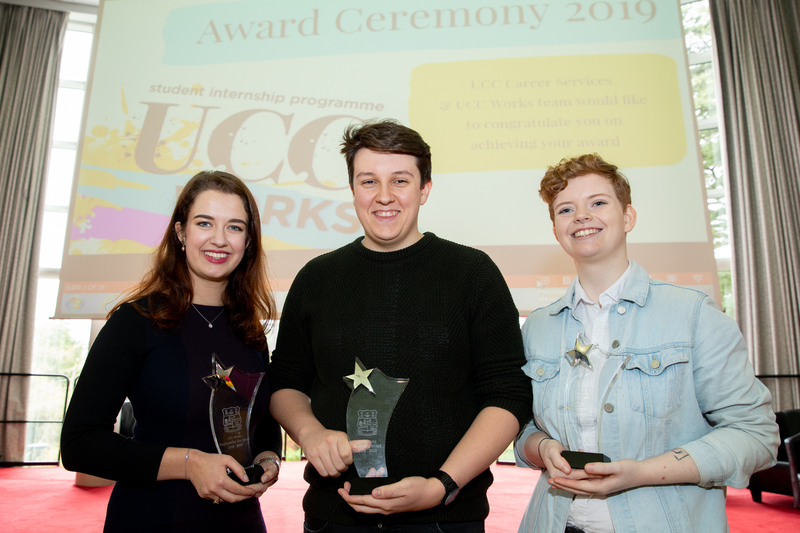 Super proud of these students today - at the UCC Works Awards Ceremony, March 20th 2019, Devere Hall! Carla Reinhardt, Eoin Jeremiah O'Driscoll and Rían Browne O'Neill, all three winners of very prestigious UCC Works Awards today. Carla has received the 'Employability Star Award' for her achievements in all UCC Works pathways! Carla has been a remarkable UCC Works ambassador over the years achieving her awards continuously over the past four years in UCC for continuous volunteer work and giving back to the UCC Community. Eoin has worked tremendously hard in various leadership roles over the last few years in Student Life and Volunteering Pathways, and today has achieved the first ever Leadership Award in UCC Works for developing leadership skills and being a true ambassador for our students. Rian has been awarded the first ever UCC Works Global Citizen Award. A global citizen is someone who will take an active role in their community, and work with others to make our planet more equal, fair and sustainable. Well done Rian! Congratulations to all students today on achieving your awards, UCC is incredibly proud of all your successes and your remarkable contribution to our campus community and beyond. Well done to all. 11/09/2018 - UCC Volunteering Fair 2018 will showcase 45 volunteering bodies and organisations, and we will also launch the 2018-2019 UCC Works Programme on the day. 22/03/2018 - Wow! Congratulations to all students on achieving your UCC Works Awards on Wednesday 21st March. 04/10/2017 - UCC Works Awards Registrations are open until October 31st 2017. 23/08/2017 - UCC once again hosts the Annual Volunteering Fair for students, staff and graduates. 02/05/2017 - UCC Career Services has just won three awards at the 2017 Awards, held Thursday 27th April in the Mansion House, Dublin, which commend initiatives in employability.